On Sunday, April 29, the Friends of the East River Esplanade (60th-120th Streets) will celebrate the newly reopened public pavilion with Alice Aycock’s acclaimed work, East River Roundabout, as its focal point. The spring afternoon festivities will feature live music, dancing, crafts and activities for children, and free ice cream. The newly renovated Andrew Haswell Green Park under Roundabout features a large lawn with shrubbery surrounded by seating and chess and checker tables. The park itself serves as a frame to Aycock’s awe-inspiring work, creating an ideal venue for people to experience the monumental sculpture with a backdrop of river views, passing boats, and sunshine. 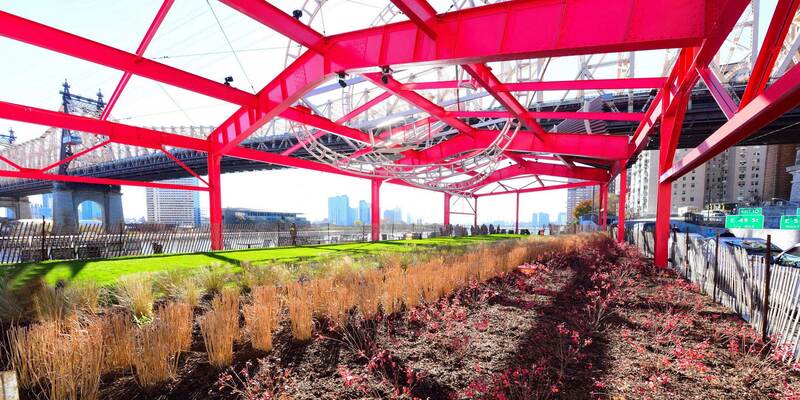 The site, a former heliport, was reclaimed as public space by a grassroots advocacy campaign led by the East River Waterfront Conservancy and Aycock was selected to transform and activate the new pavilion.